Tonight, local production company Sangha Studios will hold its own music showcase at recordBar. The show kicks off at 7 pm with a special dinner performance by Stacked!. 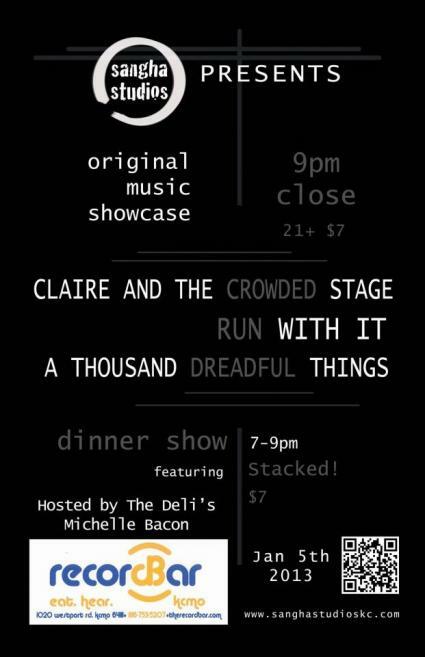 At 9 pm, performances will begin from A Thousand Dreadful Things, followed by Run With It, and Claire and the Crowded Stage. All three bands will be releasing EPs at the show. A Thousand Dreadful Things is a seven-piece band born out of the musical performance of Titus Andronicus last summer at The Living Room. Composer Eryn Bates and the band sets Shakespearean language to lush, theatrical tunes. The group will release its debut self-titled EP at the show. Run With It is also releasing a debut self-titled EP. This energetic party rock four-piece has a groovy, crisp blues sound while incorporating R&B and soul into its repertoire. Claire Adams and eight multi-talented musicians make up the collective Claire and the Crowded Stage. Adam's smooth voice weaves in and out of a unique brand of quirky, intricate music. The group will be releasing its second EP, Technicolor. The show will be hosted by The Deli KC's editor Michelle Bacon. Sangha Studios is committed to help showcase local bands through reasonably-priced recording options, as well as music lessons and for-rent rehearsal spaces. The Deli KC and Midwest Music Foundation strive to help musicians further their craft through several different methods, and we're happy to work with other local groups—like Sangha—with these same goals in mind. Tickets are $7 at the door or can be purchased at the link here.